More than 100 teams from around the world--most from well-known, university-level engineering programs--competed in the event, including from Asia, Europe and South America, out of 120 that had pre-registered. Hope was the only undergraduate college among the 10 schools from Michigan that had registered. Hope's team won the William C. Mitchell Rookie Award, which recognizes the rookie team that achieves the highest overall score. 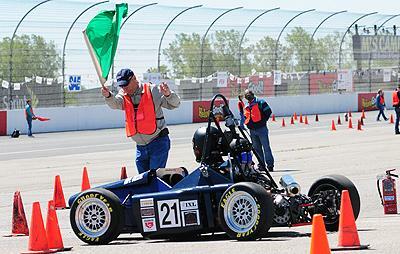 The team's composite score included 35th out of the 73 teams that competed in the "autocross" component, which was a timed road course-type event. "It's an extraordinary showing for a first-year team," said the group's faculty advisor, Dr. John Krupczak Jr., professor of engineering and chairperson of the department. "To have our team go up on the stage and get the Rookie of the Year in front of the engineering who's who in the U.S. and even abroad really showcases what they can do," he said. "It's a testament to their academic ability I was very proud to see." The Hope team began planning during the 2007-08 school year, and following some initial designing during 2008-09 did most of its work during the recent 2009-10 school year. The students designed and built the car on their own time as well as in conjunction with their academic program. In this past spring's senior-level design course in engineering, during which students develop projects of their own choosing, two groups worked on the body structure and electrical system respectively. More than 20 area firms assisted with the project by providing either in-kind or financial support, from Hudsonville Ice Cream and Creamery, the car's primary sponsor; to Energetx Composites/S2 Yachts, which manufactured the carbon-fiber skin that covers the car; to IXL Machine Shop and Louis Padnos Iron & Metal, which welded the frame. In addition to Krupczak, the group has been advised by Dr. Richard Frost, who is vice president for student development and dean of students.